LED lights have become a favorite for many cinematographers. There are tons of great options available, but knowing which to choose can take some heavy research. Which is the best LED kit for video production? StudioBinder has separated the wheat from the chaff. We created the ultimate list of the 27 best LED video lights for video production in 2019. By the end of this article, you’ll know enough about the LED market to make a confident purchase that gets you great lighting. Everything you need to know about LED Lights. LED lights have been used since the 1950s in appliances or for Christmas lights, but in the last decade LEDs have become an option for home lighting, and, even more recently, for video production. LED stands for light-emitting diode. An electric current passes through a diode (a current switch) to trigger a reaction that generates a near-heatless light known as electroluminescence. A luminescent layer of phosphor covers the entire LED. What advantages do LEDs have? LEDs use very little energy. LEDs output very little heat. LEDs have the ability to be multi-color. Let's keep it technical, but break it down into more understandable layman's terms for you. So that's how the guts of the actual LED light provide illumination. While it's important to understand the inner-workings of the thing, you're here because you want to use the best LED video lights in your project. Now it's time to drill down into video lighting and colors. How does video lighting work? Video lighting is very different from photography lighting. You need continuous light to capture proper recordings. Lights that are not flicker free may look fine when being used for still photography, but they will have harmful effects on your video recordings. Light and color have an interesting relationship. Ever since cameras have captured images, two color models have interacted with each other in the "capture-to-print" workflow. One color model, known as the four-color process, or CMYK (for cyan, magenta, yellow, and black), is traditionally used for anything in print. 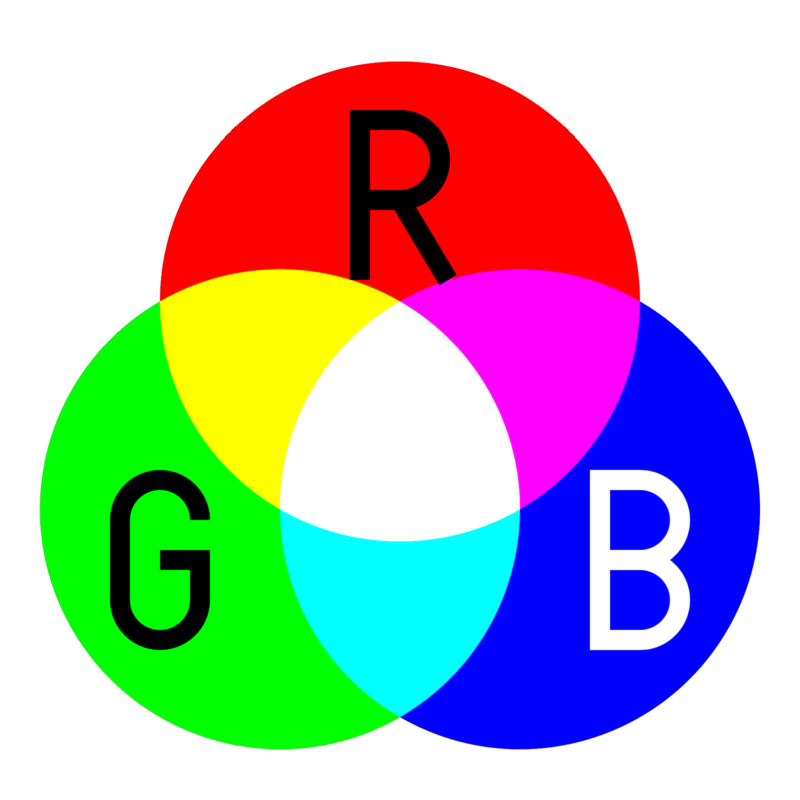 Another color model, RGB, stands for red, green, and blue. Today it's mostly used in digital design, as it represents the colors on computer, TV, and phone screens. RGB is known as an additive color system. The colors are added together in different combinations to produce a wide spectrum. In the RGB model, light blends by superimposing red, green, and blue beams. At zero intensity, each of these colors appears black, while at full intensity they appear white. You will want to remember this whenever you light something because the color temperatures of your lights may not always be the same, and you will oftentimes have to light based on the sun or available light. Many of the LEDs on this list are bi-color, which means you can adjust the color of the lights via a knob on the back of the fixture. Say, from red to green. We’ve split this list up between LED light kits, LED on-camera lights (meaning the lights mount onto your camera), and other LED lights (or "special" LEDs). This will help you sort through to find exactly what you need for your upcoming project. The LEDs on this list will give you the best results when recording video. Every one of the professional video lighting kits and LED camera lights on this list will work for shooting interviews or YouTube videos, at minimum. Generally, the more expensive the kit, the more light output you will receive. This will give you color fidelity so that skin tones don’t end up green or magenta. This allows you to adjust you color temperature. Eliminates flicker during video recording. We start with this Bescor because of its two Photon LED panels. The light stand can stretch up to 78 inches tall (that's six and a half feet). We like the color temperature range of 3200-5600K. It's also dimmable, with dim level and color temperature on the digital display. And it can be powered by the included power adapter or optional NP-F batteries. And the price point makes this the best budget lighting kit for video. These lights have a built-in dimmer that can adjust output from 10 to 100 percent, as well as a variable color temperature between 3200-5600K. LCD digital readout, barn doors, and diffusion included. Can attach these lights to your camera, too. This kit gives you a relatively inexpensive LED video light panel with decent output. You can light an interview subject, and these lights have variable brightness and color settings. They also come with optional battery power if you need extra mobility. Here's a user friendly kit that has surprising power. Battery capable, with built in Fresnel lenses that magnify the light output. So powerful you can double up on diffusion for a super-soft look. Good for interviews, or to light a full scene. This 3-point light kit includes three Bi-Color panels with 4-way barndoors. Also diffusers, a multi-voltage AC adapter, light stand, and an NP-F battery plate. Variable color temperature from 3200-5600K. Dimming capability from zero to 100 percent. And the multi-light control capability allows control of all three lights at once. Variable light intensity, focus, and color temperature. Dimmable from 10-100 percent, and color is variable from 3200-5600K. Adjustable angle lens starts at 55 degrees. Can be focused down to a 25-degree spot for selective lighting or sunlight effects. And it comes with a carrying case. This LED video light panel includes variable color temperature from 3200-5600K. Dimming from zilch to 100 percent. Outputs the hot-light equivalent of a whopping 1,000W, but with a low electrical draw of 60W. Powered by the included 100-240 VAC adapter or by optional V-Mount 12 VDC batteries. A more robust version of the above Dracast kit. Remote control capability and really good output for LED light panels. Variable color temperature, and fully dimmable. Includes removable 4-way barndoors, a diffusion filter, V-mount battery plate, multi-voltage AC adapter, and a nylon case. Wireless remote to control full color temperature and 10-100 percent dimming. Four-leaf barndoors provide control over light spill, and feature removable light intensifiers. V-mount and Gold mount battery plate. A large amount of output for this LED video light panel. Includes nine lights total, and full RGB control over each. These are great for practical lighting in music videos or sci-fi projects, as well as helpful fill lights for stylized recordings. All the rage with many gaffers and cinematographers. Color temperature range of 2800-6000K. Dimmer is 0-100 percent. These lights have impressive statistics for any light source available. One of the best LED lights for video production. Four bendable light sources with dedicated softboxes. Mounting hardware, four stands for positioning the lights, and a pair of D-tap cables which allows you to power with lithium-ion batteries. Color temperature range of 2800-6000K. Dimmer is 0-100 percent. These are the same lights as the earlier Westcott kit, but there are four of them instead of two. The gel channel has presets for more than 100 well-known temperature-modifying gels including blue/green screen, sodium vapor, and mercury vapor. Hue adjustments along a 360-degree range like a color wheel. Saturation channel controls the intensity of the chosen color. Plus, it's a Kino Flo, so you know it'll deliver the goods among the best LED lights for video production. It uses 140 watts of power and connects to the single DS3 power supply with a long, 30-foot cable. Lots of accessories and a limited 3-year warranty. Not cheap, but one of the most impressive lighting kits for video production you'll find anywhere. This LED features a 125W equivalent beam. Daylight balanced at 6500K. Amber colored-correction filter. Dimmable from 25-100 percent. 75 to 80 minute run time. Uses six AA batteries. One of the best LED lights for video, mounted on your camera, for just 40 bucks? It's no wonder we lead the on-camera section with this model. A 60-degree beam angle, 5500K daylight light. Comes with a dimming dial for adjusting light output. Powered by either one Sony NP-style battery or six AA batteries. Swivel shoe mount attachment makes this a solid LED camera light. Diffusion and orange warming filter included. Output of roughly 100W at full power. Only 15W power draw. Bi-color from 3200-5600K. Dimming from 10-100 percent. An inexpensive light like this can give you just enough light to keep footage in a usable place. Make sure you have something like this in your kit. 3200-5600K variable-color LED light. 160W equivalent light output with 45-degree flood beam angle. Approximately 20 feet of effective distance. Brightness dimmer dial on the rear. In general, on-camera options are going to be comparatively small LED lights, and this is a good compact choice. This light comes with a 45-degree beam angle, and 3200-9500K variable color temperature. Dimming dial for adjusting light output from 0-100 percent. Powered by an L-series battery, D-Tap, or USB-C. Battery-powered. 3200-5600K variable color temperature. Flicker-free dimmer. Ball head shoe mount included. Stackable with other lights for extra output. A powerful, small LED light option. Adjustable 3200-5600K color temperature, and 640 lux brightness at 3 feet. Flicker-free brightness dimming from 10-100 percent. Color/brightness dials on the rear. Stackable vertically and horizontally. Magnetic, snap-on diffuser included. Adjustable color temperature from 3200-5600K. 1400 lux brightness at 3 ft. Flicker-free brightness dimming from 10-100 percent. Magnetic, snap-on diffuser included. 360-degree swivel / 180-degree tilt ball head, and carrying case included. Adjustable color temperature range of 3150–6300K. Dimming uses shutter speed and ISO information, as well as distance data, to calculate the proper aperture for your shot. Cinematographic Special FX, or CineSFX, features a variety of settings which includes strobe, lightning, throb, color cycle, fire, police, television, and more. Powerful light suitable for use mounted on a camera, stand, or hung from a grid. Variable color temperature from 3200-5600K. Dimming from 0-100 percent. This light is super powerful for an on-camera light, and it's one of the best LED lights for video production, hence the price tag. Rollable and flexible LED video light. Brightness adjustable, use your cellphone control it like a remote control. Battery or plug-in powered. Waterproof material. Switch between either 320 variable color temperature LEDs or 40 RGB SMD LEDs. White light mode with color temp range of 3200-5500K or a Full Color RGB mode that can be configured via mobile app. Integrated lithium-ion battery. Really useful light panel with tons of applications. Great for music videos, but also can be used as a key light for any interview situation. Offers more options than most LED lights. Four easy-to-use operation modes. Color temperature, digital gels, and 10 animated lighting effects. Also, the LCD interface is controlled through free Conductor mobile app. Now that you have a solid grasp of the best LED video lights for video production, you might be ready to look into cameras. Check out our article on The Best Mirrorless Cameras for Filmmaking in 2019 and see exactly which mirrorless camera is the best for your needs. We break down all the specs and features, so take a look.